When I checked on November 18th, our rain gauge was almost full—over 5.5” fell in a week. The coho salmon have started to run up Tarboo Creek in response to the rising waters, and in a gathering dusk tonight I stood on a one-lane bridge above the channel, watching a beautiful female coho dig a nest in a bed of gravel, just below me. It was a lovely moment, but something unusual was going on, too: she was alone. We have never, in our 13 years of work on this stream, seen a female excavating a nest without at least one male, and usually two or three, in attendance. Watching her work alone reminded me that we’re facing two threats in the effort to restore a high-functioning salmon stream and wildlife area in the Tarboo watershed: one is by sea; the second by land. 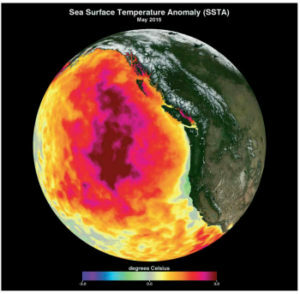 About four years ago, oceanographers at the University of Washington noticed a large area of extraordinarily warm water forming off the Pacific coast of northern North America—starting in the Gulf of Alaska and eventually extending south to California. They nicknamed it “The Blob,” inspired by maps showing its extent. In some places, the water was 10°F warmer than the average over the previous decade. Biologist ribbon markings of Redd (salmon egg) nests in the gravel below. One of the largest outbreaks ever of toxic algal species—the organisms that cause paralytic shellfish poisoning—closed crab and clam fisheries in large parts of the region. At different locations and times, there were unexplained die-offs of large whales, sea otters, seals and sea lions, and the fish-eating seabirds called common murres and Cassin’s auklets. Researchers documented large increases in populations of fish and invertebrate animals that thrive in warm water. Biologists recorded the lowest runs of some salmon species in almost 50 years. The Blob has now dissipated, but salmon runs all over the Northwest are feeling the residual effects. The little smolts that migrated to the Pacific Ocean from Tarboo Creek and other streams two years ago had to cope with warm water the entire time they spent in the sea growing to adult size. 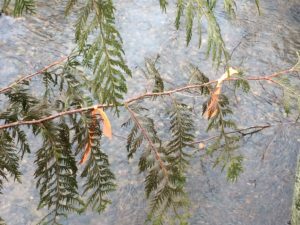 Runs of both coho and chum salmon in Tarboo Creek are down for the third year in a row. We just have to hang on, and keep working until they recover. Friends and neighbors in the watershed have banded together to oppose the proposal; for one thing, the site is less than two miles from heavily traveled roads—including two state highways—on three sides, with a public fishing and swimming area just yards away on the fourth. It’s hard to think how the site could be safe, as stray bullets from the shooting ranges have nowhere to go without a clear potential for hitting someone. Along with Northwest Watershed Institute and Jefferson Land Trust, we are now 13 years into the effort to create a national model for watershed-scale community conservation. The work has involved thousands of individuals, dozens of public and private organizations, and millions of dollars in direct expenditures to support land purchases and conservation easements. It would be ironic if, after all this exertion and success, Tarboo Creek ended up being a rally point. * Later we learned that they lost their lease and are in a dispute with the landowner about extensive lead contamination, among other issues. Follow Scott and the Project on FACEBOOK. © Scott Freeman. All rights reserved.